After some recent technical improvements behind the scenes, we are confident that our readers, especially in India, the Far East and Oceania, will have felt major improvements in our website responsiveness and speed. 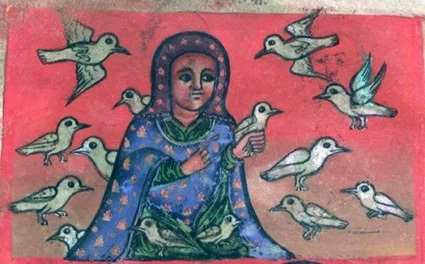 Unfortunately, as a side-effect of these recent changes, one of the image links in yesterday’s newsletter was broken, and you may have missed what we consider to be a very beautiful and powerful image of the Ethiopian saint, Mother Walatta Petros. Here it is again, with our apologies and best wishes. The image goes with the anatomical poem in her praise, and it reminds strongly of the French poet’s intuition that “Only birds, children and saints are of any interest” («Il n’y a que les oiseaux, les enfants et les saints qui soient intéressants»).